The caravan has recently been double glazed for extra comfort. It is situated on The Grange Caravan Park with access to Ingoldmells village through the park where you will find all the shops, cafes, take aways, amusement arcades you need. A 10 minute walk down Sea Lane will bring you to the wonderful attraction, Fantasy Island and East Gate Market which is open daily, (March - October). There is also access to the beach and local show bars. The caravan has 2 bedrooms, a double with ensuite facilities and a twin bedroom with separate toilet. All mattresses have been recently changed with duvets and pillows. These are protected with mattress and pillowcase protectors but Sheets, duvet covers and pillow cases, NOT included. There is a double pull out in the living room. The kitchen is equipt with gas cooker and hob, under counter fridge, microwave, kettle and toaster. There is also a fully enclosed decking area outside. The living area has a flat screen TV/DVD and Sky is set up with the sports package. All round seating with dining area and gas fire. There are heaters for the bedrooms if necessary. New in June 2017, The Chase & Grange Park now host the new Clubhouse, "Woody's Bar & Restaurant". The development boasts a large family bar, a restaurant, offering a large variety of food and drink. Live entertainment and to the rear an outdoor children's play area. There is also a launderette adjacent to the office on The Chase. Katie’s caravan is brilliantly equipped, clean and comfy. It’s in a great part of the park too. From making a booking request, to visiting the caravan, the owner was quick to respond to questions etc, and provided good information. 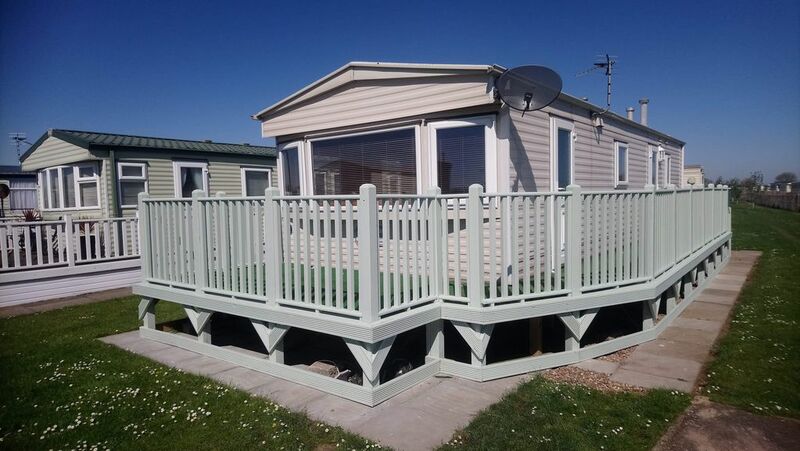 We had a good week stay, the caravan is clean, equipped, and more than spacious enough for four people, the table and chairs outside on the decking are perfect for sitting in the sun with a drink or a book, or both. The site is a 2 minute walk from Ingoldmells center, shops, pubs, etc, and 10-15 minute slow walk to Fantasy Island amusements and the market, and about the same to the beach. All in all, a good clean well placed caravan, perfect for a stay in the Ingoldmells / Skegness area. Thank you very much for your kind review. I’m glad you enjoyed your stay. Had a relaxing weekend weather was sunny. Sitting in the sun on the decking would definitely recommend. Best few days I’ve had will definitely be going back!! Site is nice, location of caravan is great and the van is brilliantly equipped. Thank you very much for your review. We’d be happy to have you visit again.